This sewing pattern is available as pdf-download either to print at home as well as to print-at-copyshop (1:1). PLEASE find the instruction in the pdf file. The pattern files (print at home and print at copyshop) are included in the zip file. Pattern and Sewing Instructions: Sewing Pattern “Amy” Parka is a casual lined oversized coat with dropped shoulders, a comfy hood and deep pockets with folds. The zipper in the front is hidden by a facing. Have you seen? 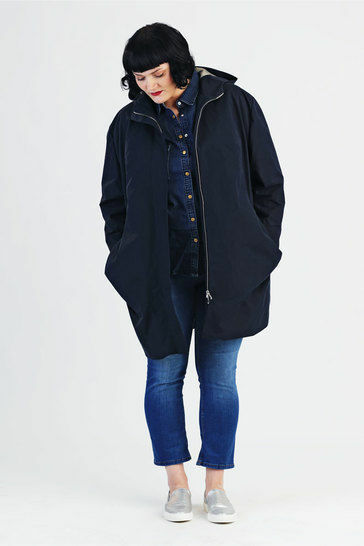 The Amy Parka is also available in sizes 34 – 46! Fabric recommendation For the “Amy” Parka you best use more solid fabrics such as canvas, waxed fabrics or thicker woolen fabrics. For the lining all usual lining fabrics can be used. If you like your “Amy” Parka to be more cuddly you could also use some fur faux or plush as lining.